News of the Dungeoneer RPG trickles out slower than molasses in winter. I do try, at the very least, to post something once per month here. Most of the cards I have previewed have been for Hero players. 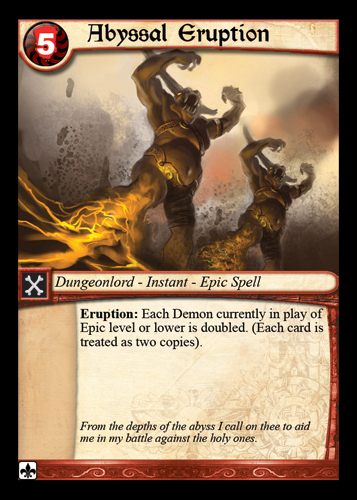 In this installment I wanted to preview a card for Dungeonlords. This is a particularly nasty one that your players really will not be happy to see come into play. A tad expensive at 5 Peril, it more than makes up for its cost if you have multiple Demons in play, especially against a band of snotty Heroes who think because they are now "epic" level that few challenges can withstand their awesomness. Note that cards are subject to change from now until publication. But this one has proven to be pretty solid in gameplay, though a tad limited since it only works for demons currently.